Set and track your goals, subgoals, task and subtasks, improve your productivity and accomplish faster by using GoalEnforcer\'s innovative visual approach for goal setting and task management. Set and track your goals, subgoals, task and subtasks, improve your productivity and accomplish faster by using GoalEnforcer\'s innovative visual approach for goal setting and task management. Quickly break down your goals into manageable sub-goals and actionable tasks. Keep track of your progress by monitoring a colorful project activity list. Improve your focus and get things done \'right now\' by moving your most urgent items to the Hyperfocus Zone.GoalEnforcer Hyperfocus is very easy to use and very flexible: it can be used for goal setting, brainstorming, thought organization, project management, as well as task list and to-do list management. No matter if you need to manage a new business, lose weight, or plan for school achievement, GoalEnforcer visual goal setting software should help you set and track your goals, get things done and achieve the ultimate success. GoalEnforcer visual and intuitive interface is very easy to learn and a pleasure to use, you should be able to get started in minutes.GoalEnforcer Hyperfocus also includes built-in calendar, Gantt Chart, status report emailer, interactive tutorial, progress chart, status report viewer, HTML generator, an innovative G-map graph showing your global work breakdown structure, password protection, multi-project navigator, quick brainstorm mode, timeboxing timer, progress and milestones chart, hyperlink and notes support, built-in FTP for cloud storage and retrieval, project data import/export including Outlook, Word, PowerPoint, Excel and Freemind. 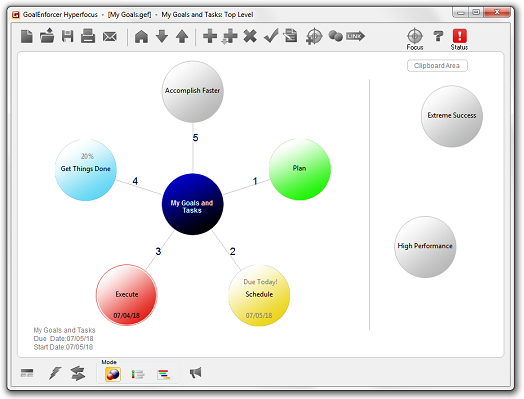 The new Org Tree, Bubble Map, Pie Map, and Radial Tree eye-catching visual reports visual reports can turn your goal setting project into something that everyone will understand at a glance. Convenient tool for managing tasks and planning daily activities. Automatically generates accurate timesheets, weekly and project reports. With PowerPoint Converter convert you PowerPoint to other formats files; you can get the output formats, such as, Flash movie, PDF, and images formats. This software is a stand-alone, fully automatic software application. Web based time tracking software for Internet/Intranet featuring employee timesheets and various reports and project management tools that include salary calculation, invoices and expenses, online services and PDA package.